When we talk about our “dream bed” or “dream house,” we’re usually talking in aspirational terms, not referring to actual dreams of the strange and surreal nature. But it’s interesting to think about how objects can take on their own lives within our subconscious activities, warping into something different altogether. Do you dream big, dream small, or perhaps have nightmares of shapes like these? 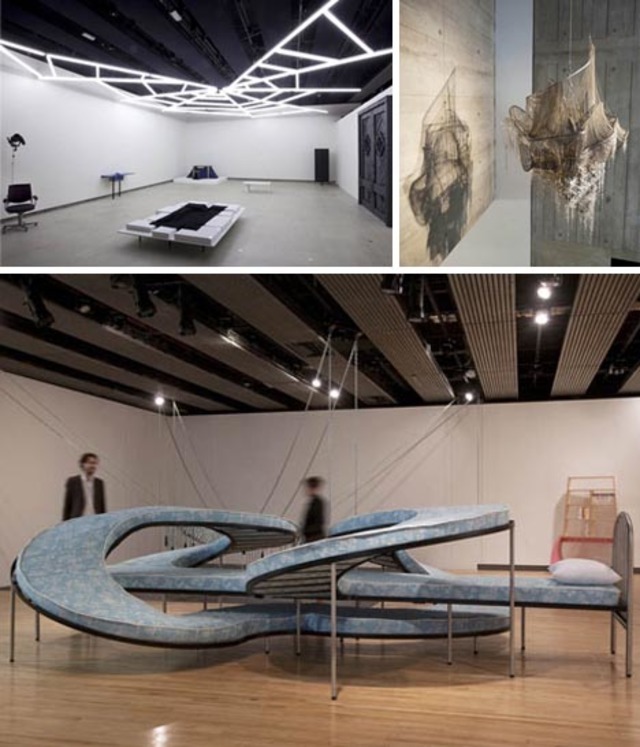 “The New Decor” is an interesting exhibition exploring interior design through installation art and sculpture that will variously inspire ideas or instill horror in those who view these dreamy (or nightmarish) multi-faceted works. Either way, the results of this experiment are impressive; these artists were given license to dream up the impossible … or at least implausible. 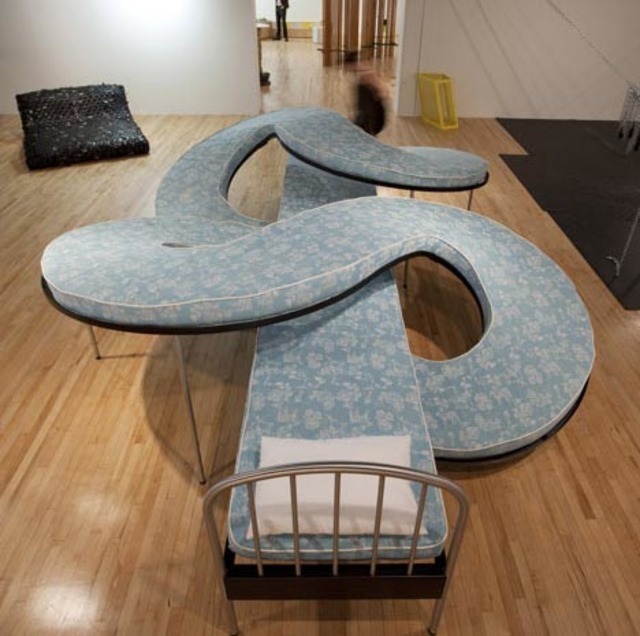 Los Carpenteros created the crazy curved bed you see above, which gives new meaning to ‘twisting and turning in your sleep’ by abstractly retracing the way we think about beds and bedrooms: after all, how many of us get a good night’s rest each evening? 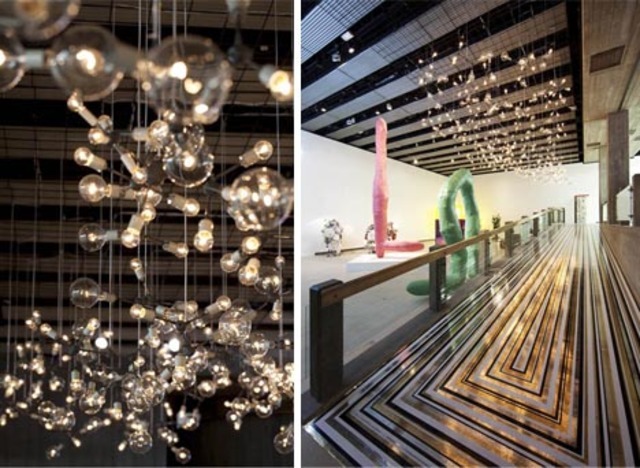 Other pieces in these series take over whole rooms, or parts of rooms, to make more than just a statement about an entire space beyond single furniture object. 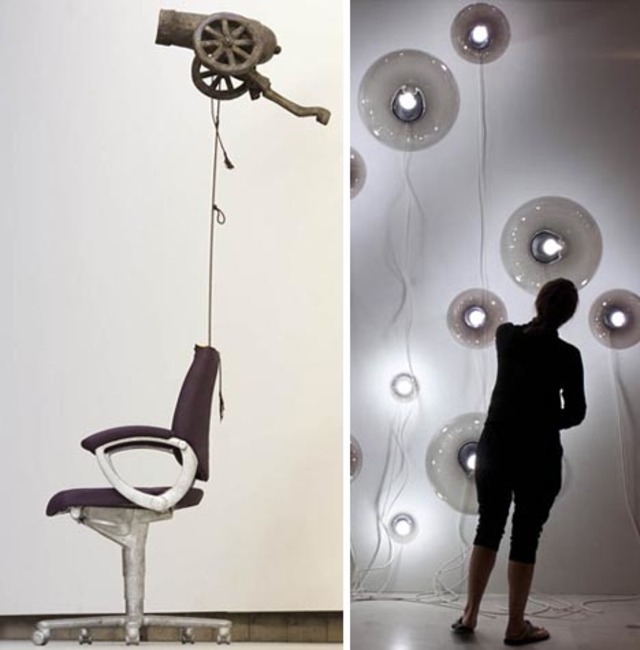 The rest of the works range in style, substance, and tone, from the impossible gravity of an aged iron cannon tethered to a typical office chair on wheels to light fixtures made like infinite bulb-based fractals and lamps that rise like sea creatures to float above the floor. 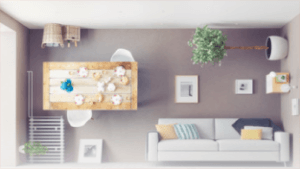 Strangely, a few of these are just realistic enough to make you want to have something like them for your own home – though perhaps on a smaller scale. Accompanied by a fully illustrated catalog, the curious exhibition traveled to The Garage Centre for Contemporary Culture in Moscow, where it was on display from 19 October 2010 – 6 February 2011.